by a post-accident or fatality situation. All contributions are tax deductible as the Foundation is an officially recognized 501 c-3 organization. 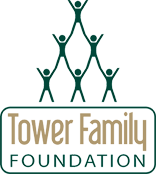 The Tower Family Foundation welcomes contributions of all dollar amounts. will be designated and promoted as distinguished donors to the Foundation. PLEASE NOTE: When clicking "Submit for Payment" above, you will be directed to PayPal to complete the payment process. If you do not have a PayPal account, PayPal will allow you to use any major credit card to securely process funds. Your donation will not be complete until you receive confirmation of payment from PayPal.